First, it is temporary, so it can be used to suspend rather than ban. Second, if you are requiring your users to authenticate via email and you are not allowing duplicate email addresses, it will make it slightly more difficult for them to simply recreate their account or create a new account. 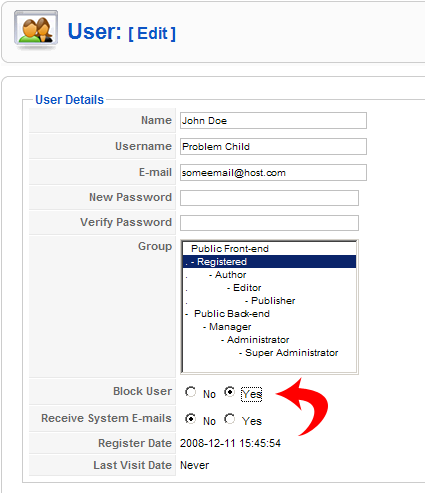 From the Main Administrator Screen (http://www.example.com/administrator), click User Manager. Locate the problem user using the filter. The easiest way to do this if you have a large number of users is to type part of their name, user name, or email address in the search box and click Go. Select the user by placing a checkmark next to their name. At the top right of the screen, click Edit. On the lefthand side of the screen, towards the bottom, select the Yes radio button next to Block User. At the top right of the screen, click Save. Visually verify the user is blocked by looking for both the Successfully saved User message at the top of the screen, as well as the icon with the white X in a red circle under the Enabled column. First, because the problem user may not actually be the owner of the IP address. Second, because most IP addresses are non-static, so they will change periodically. For example, if the person is using a wireless laptop, and simply moves to a different wireless router, they will end up with a new IP address. This page was last modified on 30 May 2014, at 00:09.